I just love my little capelet (is this actually a capelet? I’m not 100% on the terminology, but it seems too little to call a poncho…). It’s toasty, but light and short enough (elbow-length) to throw over anything and still have a pretty normal range of motion. If you don’t like the rolled edges, trim in garter or seed or something unrolly, or start with a couple knit rows and a purled row & turn the edge under to hem. It’s knit in the round from the bottom up, and there’s a simple, fat cable going up the middle. It’s a good, easy project for My First Cable. And this was, in fact, my first cable that wasn’t just a swatch. I kind of only like big fat cables. This yarn is cheap (under $4 for a 4oz hank) and old timey and I love it. It’s called Briggs & Little, from Canada’s oldest yarn mill, apparently. It’s got lots of lanolin & feels stiff to begin, but kind of warms up as you knit it. With washing, it blooms from a somewhat stiff fabric to something soft and full and bouncy. 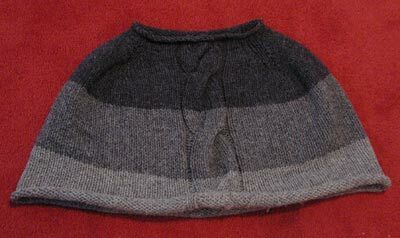 It’s a little rough for a next-to-skin item, but it’s fantastic and sturdy for something layered, like this capelet. 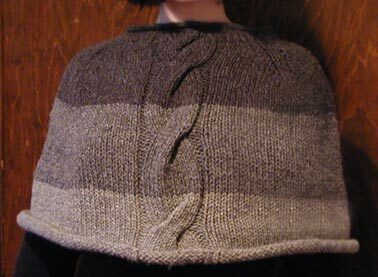 This garment uses 3 natural-looking colored heathered grays. There’s a fair amount of vegetable matter you have to pick out, but I actually kind of like that, makes it feel all the more rustic. You can mail order it from Deanna Dunsmuir in New Brunswick. Cable 12 back: Slip next 6 st onto cable/extra needle. Move those stitches to the back of your work, then knit the next 6 stitches on your left needle. Side the reserved stitches to the end of the needle they’re on, and knit them onto your right needle. Cable 6 back: Slip next 3 st onto cable/extra needle. Move those stitches to the back of your work, then knit the next 3 stitches on your left needle. Side the reserved stitches to the end of the needle they’re on, and knit them onto your right needle. With Light Gray, CO 145. Join & PM, being careful not to twist st.
Place cable panel markers: K64, P2, PM, K12, PM, P2, K to end. Switch to Medium Gray. Starting with #3, work as for Light Gray. Note: You’ll need to switch to the smaller needles after a few decrease rows–after the cable is a convenient point. Work 9 rows in pattern. PM for raglan shoulder decreases: K24, PM, K24, PM, K16, P2, SM, K12, SM, P2, K16, PM K24, PM, K to end. Work rnd in pattern, working Cable 12 back at center panel. Decrease one last time before and after each shoulder marker, and also work the following decrease/cable between the cable markers: ssk, K1, Cable 6 back, K1, K2tog. Work row plain, except between cable markers: ssk, K4, K2tog. BO. Weave in all ends, working in ends at color joins in duplicate for a few stitches, then weaving in normall. Soak in cool water with wool wash or shampoo for 5 minutes. Squeeze suds through gently, rinse gently, roll in towels, pat into place, and let air dry. Here’s a crappy picture of me wearing the capelet, which is a little rumpled from being worn nonstop for a week & then wadded up on a chair for another week. It’s I’m useless with the auto-timer, so I’ll try to get Ron to take a fresh, pretty shot next time I get around to washing it. Dood, I love your mascot, too. The whole blog is awesome! Thanks! I’m finally getting to satisfy my desire to chronicle the excruciatingly dull details of my craft life without sending poor Ron into a coma. Haven’t really mastered using the software yet, though. On #7, no plain rnds in between (or, honestly, you could & it wouldn’t matter–I wrote this so long ago, I can’t remember why the more rapid decrease at the end). And from looking at the pattern notes, which mention c6b not c3b, I think that must be a typo, which I am going to fix right now!